Taylor Price invited me on his TPT podcast Wednesday night. As you probably know, Price used to work for the 49ers. Now, he’s an independent voice with a terrific podcast. Check it out. Yup, Price says they need to spend the salary cap space. Being cheap produces cheap results. Right now, they have 40 mil in cap space. They should spend 2 mil for Kelvin Benjamin. Taylor Price was one of those simpering sycophants, who were total homers. Funny how he and Grant worked together for years, but did not socialize. Glad he has grown, moved on, and can appreciate Grant’s journalistic method. Great interview, and am glad Grant has thick skin. Interesting to hear how Lowell dealt with the hate, and Grant’s perspective, being the son of a media personality. Now that Taylor Price is no longer a Niner employee, I like him better. I gotta laugh. Want some negativity about the Niners? Grant’s your man! Poor Grant. He can say 10 positive things, but posters dwell on that one negative thing. The ratio is 1 to 10, respectively. And he’s often right-but more often than not, it’s just sellin newspapers-or clicks. Naw, Taylor Price is smart, and mined gold nuggets out of that interview. Both Taylor Price and Grant like Scott McCloughan. Too bad he has a red flag. The best way to improve the drafting is for Jed to kick out Paraag. Paraag was the one who nixed Bill Walsh and John McVay’s last draft, with his analytics. Since Paraag has been helping with the draft, they have not done well for the last 16 years, except for the SM and JH years. Paraag was the one who formulated the move up strategy. Too bad it resulted in Garnett, Foster, CJB and Joe Williams. Paraag was the guy working the phones, and he let other teams work over the Niners. Niners need a more intrinsic, instinctual, gut feeling method of selection, and less analytical numbers system. I know you hate Paraag, but I don’t know how kicking out a guy that has nothing to do with player selection will improve with the draft? I don’t see any way Baalke succeeded his authority on player selection to Paraag with his ego. However, maybe you are right, maybe he is so much of a bully that Lynch secretly gave his job of selecting the players to him. Maybe, Lynch is so afraid of Paraag, that he is just puppet and has been lying to everyone when he said the picks are made by him with Shanahan’s input. Maybe Shanahan is also cowed by him; and maybe, this organization is so good at keeping information secret that no one, even former or fired employees are not willing to say that Paraag is actually running the draft. And Maybe he took a brief hiatus from running from drafting for a few years when the team brought in Vernon Davis, Bowman, Willis and Staley just throw people off his evil plot to ruin the 49ers. At least we now know that Walsh, McVay, Lynch, Shanahan, Harbaugh, McCloughan, Donahue, Baalke, Marriucci, Erickson, Tomsula, Kelly, Singletary, and Nolan are so scared of this man that they pee there pants at the mention of his name… and would never, ever say what he really does. Paraag was the guy working the phones during the draft, and if you think that ANALytics were not a big part of the selection process, you are clueless. Since Baalke has been fired, that Kentavius Street, ACL pick was all on Paraag. I can just imagine how Paraag was jumping up and down, declaring the numbers were too good to pass up on Street. Paraag, being a buddy of Jed, has way too much power. Paraag was the one who went with Jed on his humiliation tour, trying to find a GM. Paraag was supposedly kicked out when Tomsula found out he was the leaker, but Jeddy boy brought him back. They did not pee in their pants, but I bet Paraag piss’d them off. Paraag was the guy working the phones during the draft. Yeah, he facilitated the trades… that is the one part of the draft the niners have actually consistently done well on for the last decade. They have typically won the draft trade chart but screwed up the selections. He does not make the selections. Shoup you are wasting your time talking to the human piñata as if he were a rational agent. He isn’t. He dreams up conversations and scenarios and propels them out on his interminable diatribes as if they were real. You call him on it and he will obfuscate or change the parameters of discussion. You insist on the original point and he may relent saying his POV is as valid as any other and play victim. Next post, he will go right back to his original dung and claim victory and victimhood. The best thing to do is laugh at him and move on. He has no capacity for self-reflection. Our resident flat earther won’t ever let facts get in the way of a good opinion. I should know better at this point. Nobody including Seb thinks Paraag makes selections. He does however have influence over the roster. Who decided not to spend a significant amount of the cap last year? Who decides in the future? If you think that JL makes that decision without any influence from the finance department, I respectfully disagree. The explanation you gave for why Eric Reid was not signed was “slots”. Paarag is your slots man. Shanahan wanted him “long term” but slots won out. And I don’t care a bit how many on this board agree with letting Reid go. Fact is Shanahan wanted him long term and he didn’t get him. Someone else overruled him. They clearly had the money but did not want to spend it. That is an issue with this team whether you believe it or not. BTW, JL said the picks were made using a consensus process. That included Paraag. Also, JL specifically thanked Paraag for all his help, so Paraag had a ton of influence on the draft. He should thank Paraag, the trade deals were the one part of the draft they did well on. His and Shanahan’s picks however, have not been great so far. The picks are made by John Lynch after he gathers all the information from the scouting department but are subject to Kyle’s approval not Paraag’s. See I have sources, I’m not just spouting theories with no evidence. I have it on good authority that Bill Walsh’s ghost has been running the war room for the last few years. oh wait, sorry for pulling a seb. Shoup, of course JL, as the GM, would make the final decision, but unlike Baalke, he would not be a raging megalomaniac insisting on controlling everything. Both JL and KS worked as partners, and we all saw how KS had tons of influence in the selections. I also saw how Paraag had his dirty fingers in everything, and when JL thanked him for all Paraag’s help, it was not because Paraag had absolutely nothing to do with the process. Paraag is the numbers man. His specialty is ANALytics. Deny history, but I will still assert Paraag dominated Dr York, who refuted and rejected all of BW and JM’s input on the draft. Paraag dissed Bill Walsh, but I guess you like defending Paraag, and think BW was obsolete and behind the times. Yes, JL put on his Trader Bill hat,and wheeled and dealed, but Paraag was his mouthpiece on the phones, gauging interest and presenting options. And all those options had Paraag and his ANALytics behind them. Shoup, you just presented your evidence about how the draft would unfold ahead of time, I am just presenting my opinion about how it actually did unfold. Luckily, we had Peter King in the room, and his reporting showed how influential Paraag was. Paraag even leaked more smears, so JL had to apologize for the leaking, again. Sure, I have made a bitter enemies, and all the pushback I get from the peanut gallery is due to my excoriation of Baalke and Paraag. Paraag probably hates me, and sends his minions after me. I invite his scorn, because the Niners will not win until Paraag is censured. Thankfully, I hope my missives have helped get rid of Baalke, and my new comments will thwart the unctuous influence of Paraag. Jed is weak, so I do not think he has the huevos to stand up to Paraag. I sure wish Jed would grow up. Paraag is the architect of having so much salary cap space. He handles all the contracts. Hopefully, some adults in the room will convince Jed that he will continue to have cheap results, because they are so cheap, and the only way to win is to spend ALL of the cap. Pull a seb? You flatter yourself. However, keep trying, there is always hope. Shoup, see what I mean? This is full of just insane, unsupported, incomprehensible drivel. Plus, he played the victim card. You can set a watch by this guy, he is so predictable! Lol. There is no other way to put it, sebnynah is an idiot. Sour yeast, I apologize… smh… I feel dumb for subjecting the board to that nonsense. Shoup, I also think Paraag and his analytics were a big factor in the drafting of Foster. I bet he was jumping up and down, declaring that according to analytics, Foster is too valuable to pass up, and even allowed the Seahawks to take advantage of his desperation, and traded up to get him. That pick the Niners gave up is now the starting FS of the Seahawks. And Foster has disappeared like a puff of smoke. Ha ha well as to the victim card… I guess I should pick on the mentally handicapped. Sebs, you don’t get a hard time because of your opinions about bulky and prag, and you know it! Jed, Bulky and Prag made the worst front office in the NFL. Since Paraag has been with the Niners, they have never won a ring, and with Paraag continuing to meddle, they seem to be doomed to never win another. 16 years and counting. Scott McCloughan was credited for building that SB team, not Paraag and Baalke. Maybe if they do take Grant’s advice and bring back SM, he will ignore Paraag, so he can build another SB team. Hmmm so he was able to bully everyone else into choosing his guy but not McCloughan? Maybe, he was just to drunk to realize how scary Paraag is? I guess it’s good to know he isn’t a coward like Walsh, Harbaugh, Lynch and all those other guys. We should bring him back. Still why wouldn’t he or anyone else reveal how scary Paraag really is to the rest of the world? Shoup, Paraag has bullied Jed, big time. Tomsula had Paraag sent to Sacto, but Paraag bullied Jed into taking him back. Jed is the weak one, not JL, but Jed is also the owner, so Paraag has Jed wrapped around his little finger. Bill Walsh is not a coward, and for you to imply that is reprehensible. Bill Walsh was stabbed in the back by Paraag. Paraag and his ANALytics influenced Dr York, who rejected the advice of one of the greatest football minds in the history of the game. For that, the Niners deserve to lose until the stench of Paraag is banished. Why do you think JH told Jed that the meeting was for MEN. Jed is being led around by the nose and Jed is certainly afraid of Paraag. 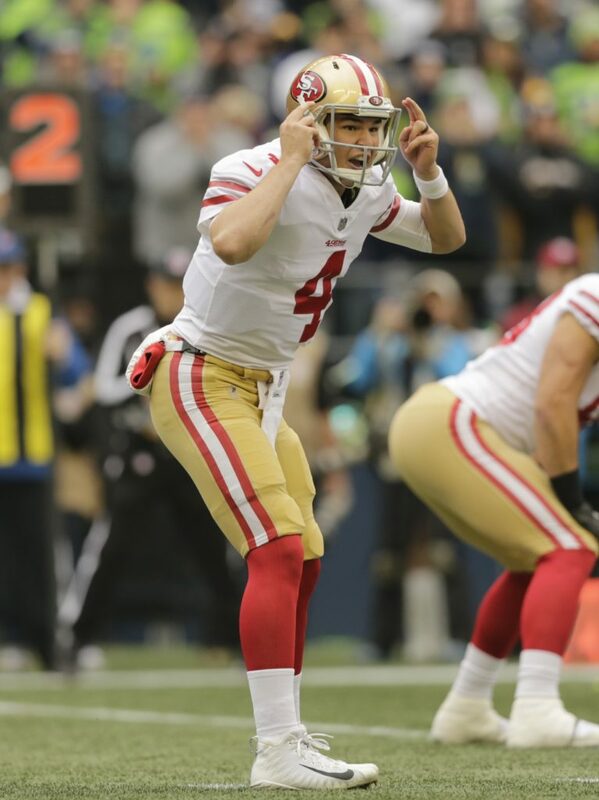 Sure, Paraag makes Jed money, but JH made Levis stadium with his 3 NFCC Games and SB appearance. Now, we look at that empty mausoleum, and Jed is seeing how little money is being generated from the concessions. I guess Jed does not care about being humiliated. Some day, he will wise up and see a suit ruining a once proud franchise. Until Paraag is gone, just expect more losing. Will Jed ever have the courage to get rid of impediments to success? I will not hold my breath. Denise should hold an intervention, and save Jed from himself. Jed SWORE he would get rid of who ever he found out to be leaking, but he must be terrified of Wormtongue. it was like pulling teeth to make jed fire Bulky-took his mother to do it. No way is Prag going-he’s good with the cap, perhaps the best! Thats why year after year after year we have a huge salary cap margin. More importantly, he is Jeds last toad. And that is very important for Jed. Just amazes me how the incompetent instinctively have that sense of survival, and leach on to either govt. jobs or ownership. Otherwise, if they were held accountable, they would be perpetually unemployed. The Anthony Davis stuff was the most interesting part. While I often disagree with your penchant for hot takes and some the rational used to justify the takes (ie, this roster has a fair amount of talent because it has some high draft picks or highly paid individuals). One thing that I really want to say I appreciate, is your research based articles. I loved your breakdown on how Shanahan’s play action game differs from Kelly’s, or your explanation on how Vic Fangio’s 3-4 differs from the traditional version. In this particular article, I liked how you spoke in regards to how you have grown as a writer and how you wouldn’t write the same way. Although, I never had a problem with what you said in regards to AD squealing (we’ve all done it before). Additionally, I agree with the need to add an older, wiser voice in the room to help balance his youth and exuberance. However, I don’t think it has to be a former head coach, (although that would be a definite plus when weighing candidates) but rather someone with a lot of high level experience, like a Fangio, but Fox, Bowles, Joeseph, could all be interesting options with Ed Donatell being a dark horse candidate for me. Short of firing everyone, what assistants do you believe could be brought in to help the team? By nearly all accounts, we have a critically ill patient–the 49ers. We want to determine what’s wrong, and we want to bring the patient back to full health. With the many voices on this blog–and of course, the voice of His Grace (not you Sebbie)–we have quite a collection of diagnoses and remedies. Through examination most have found deeply flawed coaches, astonishingly incompetent operations leadership, evil executives, and a questionable mix of players–a few pretty decent, and the rest an embarrassment–or as His Grace might say, coming up short in their profession. Funny how a few strut about proudly, declaring that ‘I saw this first’. Another topic for another time. The expedient remedy? Fire most if not all the coaching staff, purge the operations staff–including the GM, remove the evil exec(s), and empty the roster–save for a few. Now, not later. Would appear to be a logical approach. Most of us have named our favorite candidates to take over, and we’ve identified who we must draft and acquire in Free Agency. A few even want to bring back staff and players who’ve been wronged–in an effort to make things right. Achieve moral balance once more. Nice and tidy. Just do it. Unfortunately we have ownership to deal with. While it’s great fun and highly stimulating to diagnose (with certainty) and prescribe the perfect cure, we have the Yorks. The Yorks ‘own’ the patient, we don’t. The Yorks will act in ways they feel are in the best interest of their property. If they muddle from year-to-year rebuilding and rebuilding, and occasionally get into the 7 to 9 win range, they appear to be accepting of that. Want to witness change? That will require new owners. All that angry media and angry fans will do is trigger more York-crafted rebuilds. Maybe we can hope they get it right before most of us are six feet under. Pardon my typos…assembled this quickly. Things could be worse. We could be Cardinal fans. The Bidwell family has owned the team since 1932 when they were in Chicago. The Cardinals have never won a Super Bowl and won exactly one NFL championship in 1947. If there is a curse of family ownership, which there appears to be, hope and pray that the York’s aren’t out to break the Bidwell family record that currently seems unbeatable. Cassie, I have said all along that Jed should realize that suits come dime a dozen, but a good coach is more precious than rubies. Madden had it right. Paraag may make Jed money, but even my cat could make the Niners money. Her name is Moxie, and she fits her name. Yes, I will be hoping that Denise saves the day. She should take pity on Jed, and save him from himself. I know Jed likes to be rewarded for losing, but even Jed would probably like to avoid being humiliated. All reasonable. Alas, the Yorks are the Yorks, and the York way will continue to drive (shape?) 9er fortunes. Will wonders never cease. We actually agree on something. Correct me if im wrong…………..but because of TV revenues, these teams always have a positive cash flow no matter what? Point is, the Yorks being greed-heads, have no incentive to put out a great product. Having said that, I still think the jury will be capable of making a pretty accurate verdict by this team next year. A very shallow team losing their key starters just can’t compete. And yet, i’ll give them that-they have competed. They just have no talent in the secondary. Sadly ,It has been the Yorks from the beginning. Yup. And it will continue to be. You’re a bold guy. Have you sought an interview with the Yorks? They won’t let him travel with the team on away games, they now gonna interview with him? There is a charter for the press that the team pays for. It’s only for the “real” reporters that cover the team. Bet Grant is happy he does not have to travel with the team after they get blown out and humiliated. That must be a really fun crowd. Bet they are jumping for joy. Why are you and jackhammer always talking for Grant? Talk about the peanut gallery. Go work on your status Seb! Prime, did you know that when you declared that Kaep took the league by storm, that the NFL is terrified that he will do it again? But you know….you’d be the first to jump for joy if he did travel and report from the front lines. Much greater authenticity as he continues to call for the removal of coaches, execs, etc. You’d be beside yourself with glee. You know you would. You’re very skilled at making excuses for those you favor, and eviscerating those you revile. Ha! Cassie, Grant is not some sycophant or toadie, He would not suffer fools gladly. 49ers are not looking very upright and forthright by being afraid of some criticism. Like Bill Walsh says, criticism is to be expected. It is part of the job description. How one deals with it is another matter, and I wish the whole Niner organization would channel Bill Walsh. He laid out exactly how to deal with the media. Yorks are running the show Sebbie. Angry stomping, breath holding, and angry declarations of ‘they should…’ won’t change that. Wrong, Cassie. Even Denise does not like her son being pilloried in the press. Jed seems to be able to soak it up like a sponge, but being told rooms are only for REAL men, must eat at his soul. And who was his sidekick throughout his humiliation? Paraag. READ MY POST CAREFULLY… The sun is going to rise in the North tomorrow…. O.K. I acknowledge that I posted it…Now if you want to regurgitate it every day, every thread as you have Prime Time’s post about CK “taking the league by storm”…you have my permission…even in quotes…Merry Christmas, NOW, YOU FINALLY HAVE SOME ‘FRESH’ MATERIAL…. Prime really regrets saying that, and I am perfectly happy to remind the status seeker of his admission. I only do it when he engages me, so if he stops haunting my posts, I will not keep reminding him. But like a moth to a flame…..
Just like I am perfectly fine stating that teams would rather lose without Kaep, than win with Kaep. The ‘scheme fit” justification is specious, and the very fact that they will not even give Kaep a tryout is just more proof of blackballing. All of this persecution is just strengthening his lawsuit, and I hope it voids the CBA. Maybe you did not know this, but I have re-posted things I wrote years ago. I do that because those statements are still relevant, and I do that so they can learn, and not repeat their mistakes. Kaep is still relevant, and the attrition rate of QBs will soon have no viable alternatives to Kaep, so he will win his lawsuit, and get to play. If Hoyer can play like that, I will not mind if Kaep is blackballed. Twisted by knaves to be a trap for fools. You will not mind if Kaep is blackballed. Shame on you. If implies it’s a conditional sentence. Your condition was that Hoyer had to play well. He was and therefore you did not mind if Kap was blackballed. Furthermore, one can extrapolate that you had no moral reservation about Kap being blackballed at all, despite your earlier (and later) entreaties. You could have said “I don’t mind if Kap isn’t resigned by the Niners!” Or something along those lines but you made it all encompassing, belying your earlier (and later) statements of ethical outrage at the NFL, and Trump! So the only knave in this scenario is you! Your arguments reek of desperation. I still do not mind too much that Kaep is being blackballed, because he will eventually be vindicated, while you and others will be denounced as being vindictive. Hope Kaep wins his lawsuit and voids the CBA, because then, he will become even more of a hero. Meanwhile, Cassie Mid and others coddle women beaters, while blackballing social justice warriors. So, do you like to beat women? Keep trying Little Donald! Maybe you’ll get us to believe your schlock one day! My what good company you keep Seb! East, you are assuming that I lie. I do not need to lie. Remember, the truth will set you free. Good one, Under and I’d add that they’re also good at telling you what not to do while they’re doing it. Fiscal responsibility like Trump? He sent troops to the border for a publicity stunt that cost 70 million dollars, and kept those troops from their families over Thanksgiving for absolutely no reason at all, except for his political agenda. How are Seb and Trump not best friends? They’re two peas in a pod. They both make up their own facts. According to Trump the California Forrest fires would have been prevented if they only would have cleaned the Forrest floors… and according to Seb Paraag was in charge of the cleaning. They all are truly tragic,and the stories of heroism in the face of flames are inspiring. Some of the survival stories are incredible, and harrowing. Glad so many survived, but sad that there are so many missing. I hope all donate to the Red cross, in the name of the nearest fire. How could those fires have been prevented? Maybe the State should organize and think outside the box. Maybe PG&E should clear all trees within 50 feet of their power lines. Trimming is OK, but the trees grow back. Eliminating trees will eliminate the problem. Maybe only allow low growing plants like fruit trees and vinyards. Maybe PG & E should set up mobile electrical generation facilities that burn the wood and brush gathered. This would employ thousands, and create fire buffers between the forest and the city limits. Paradise is situated on a ridge, so maybe they need to build more fire resistant houses. All it might take to help some what, is wrapping the house with sheets of tin foil, before putting on the Tyvek. Stucco may be the best siding, and metal roofs are very fire resistant. Plantings around existing neighborhoods could be targeted for cleanup. The crews could work in the springtime, when the fire danger is less, but year round wood processing could happen. Those wood gatherers could also be helping harvest lumber, Even small trees are useful with the new glue laminate technologies. Urban forestry could be developed. Firebreaks in the spring would be the biggest priority, and people could earn credit for lumber if they want to build a house. Support work would also be an avenue for non lumberjack people to be able to earn lumber credits that would go towards building a home. Therefor, a woman could cook for the lumber camp, and after 2 or 3 seasons, have earned enough lumber to build her own home. All the cellulose gathered could be sized and separated. The large pieces could go towards lumber, the small pieces could be turned into charcoal, which then could be exported to save the world’s forests from being cut down to cook food in the third world. The rest should be combusted in gassifiers, with low emissions. The steam generated could be used to produce electricity, process heat for industry, Heating and cooling of homes and businesses, and even used to treat sewage effluent. Make some systems stationary, but make some systems segmented, so it can be moved to different areas, until the wood source is exhausted. Then it could be broken down and shipped to another place and set up elsewhere. Zoning changes need to be made. Building along ridge lines is not wise planning. Exit safety routes need to be designed. Hopefully the Tubbs Fire helped prepare the Camp Fire personnel so they could deal better with the fires. Timely and thorough evacuation plans need to be designed and implemented. There are still millions of acres that are unburnt, and adequate planning needs to be started. Instead of spending millions fighting fires, we can spend millions gathering resources, that employ thousands, produces energy safely and cleanly, and produces millions of dollars worth of products, while lessening the fire potential. All those politicians are excellent at spending other people’s money. Employing thousands, generating energy and products while reducing fire danger should be a reasonable goal to strive for. Every forest dweller should champion those ideas. It sure beats sweeping the forest. You have my deepest sympathies in the loss of your wife…I think that you understand the meaning of my post…Still in Florence..? I pray for God’s peace and comfort in your life. I’m sorry for your loss, I remember you mentioning that in the past. Peace be with you. Can’t imagine your pain. Alcoholism is a disease. And it’s hard to kick. That being said, I think having McCloughan as an advisor is a good idea. He’s not in a decision making position and his experience and voice could be an asset to the organization, just as it was in Cleveland last year. Why invite Grant to the podcast? Why give legitimacy to someone that is clueless and has no business being a sports journalist? 1) Jed York did invite Grant but then stiffed him with the airline bill once. 2) Grant’s place on the team plane is occupied by the Long Snapper and his “medicine”. 3) They would allow Grant to travel but he’s not been cleared by the team doctors. 4) They don’t allow him to travel because they are embarrassed with the quality of their craft service. 5) There was that one time he traveled to the NFC Championship Game in Seattle and Grant got drunk and the team is still paying for that fiasco! 6) He has a ticket waiting but they spelled his name wrong. 7) He always travels with extra baggage and the team can’t afford that. 8) Grant is a radical and on a no fly list. 9) Denise can’t afford to be around Grant, his sweaters make her swoon. 10) Papers, we don’t need no stinking papers! They would allow Grant to travel but he’s not been cleared by the team doctors. Thank you for the kind words and how the process works. Appreciate it. Can someone summarize the interview for those of us who cannot listen to it? Grant and Taylor make up. then about the A.D. story and Grant stated he was wrong in that. After that they went over what should be done to fix the team. Trever Kyle needs another year due to the injuries but also said a new D.C and some older, wiser voice in the room and possibly someone to help with the draft. Grant Agreed but said if he were in charge he would move on from Kyle and Lynch. I do have to disagree with both of their ideas. A new DC and an older, wiser voice would not change anything about the team as it is now. The defense desperately needs at least a couple of capable pass rushers to play on the line with Buckner, and the offense needs a red zone target. It would be beneficial if Shanahan looked for new coaches for the secondary and receivers, as both groups have grossly underperformed this season. Getting rid of the head coach and GM who are finishing up the second year of a huge overhaul on the team is one step closer to being the new Browns of the NFC. Sure this season has been a disaster, but the team has dealt with so many injuries that guys like Pita and Wilson are getting their number called. It also hasn’t helped that the defensive players from the the 2017 draft class have all been in a mind-boggling sophomore slump, but we need to see what they look like next season before we pass judgment on the class; however, it also would not hurt if the 49ers bring in some competition to light a fire under their butts. Thanks for the summary Shoup! Just what I was looking for. Grant also gave props to Pettis and Warner. And he said KS was holding back Kittle by not targeting him in the RZ. Good take on players skipping bowl games. I found the site the article is on during the early part of the season. It has great articles, like the one you just posted, and analyses. Yeah, the guys at TDN really do good stuff. I recommend following each of them on twitter as well. McVay has a sick brain. “Aaron Lynch is a guy who makes a lot pf plays”. Oh please! He sure shaped the Niners the last time they played…..
9ers dont have the required talent to hang with the Rams right now. Until they get that talent, they will continue to be “shaped’. Saw, with better coaching, the Niners can avoid being shaped, no matter the talent. Yeah, I guess thats so…………….way too often, 9er D is never where they should be. OK, on second thought, Im thinkin your right————-on this particular observation!!!!!!!!!!!!!!!!!!!!!!!!! Saw, I will make a prediction. The Broncos will stack the box and dare the Niners to pass. How to counter that? The Niners should spread them out wide, and attack the edges. How did KS counter the stacked box against the Seahawks? Bunched sets. If you look at Marsh, he is having his best year with 3.5 sacks. Meanwhile Lynch is starting to make more plays with 3 sacks on the year but way better than last 2 years. Both players came in in 2014. Marsh has played 9 more games in his career than Lynch too. While Lynch isn’t exactly a world beater, he is better than the guy who we have. While true, most of Lynch’s production has come while playing for Fangio. All that tells me is we haven’t had the right people in place since Harbaugh. It tells me that he needs to play in a certain scheme and a coach like Fangio to get production out of him. His defenses ranking have been all over the place depending on the quality of the defensive personnel available to him. When Harbaugh brought Fangio with him from Stanford there were reservations and dark mutterings among fans because Fangio’s defenses had been ranked solidly in the bottom third in four of the previous five years Fangio had been DC in the NFL before joining the Niners. Fangio is a very good coach and schemer and I feel Saleh has shown the potential to be one. No coach, including Fangio, can succeed with this little talent, especially in the area of QB pressure. Lynch was effectively replaced by Dumervil, not Marsh. Marsh is, of course, not the answer. Neither was Attacochu. The FO made a mistake on the pass rush front by letting Dumervil go. None of that makes Lynch much more than an inconsistent, underperforming, overweight slob who’s having some success with the Bears because he’s playing across from a HoF pass rusher like the early promise he showed as a rookie in 2014 as part of that awesome Niners front 7. In this sad sack D, Lynch probably wouldn’t have more than a sack or two. Aaron Lynch had too many games in which he showed no effort and interest as a 49er. Marsh is not much better than Lynch but at least he brings 100 % effort. If Marsh is still with the team next season he will likely just make cameo appearances. I’m very interested in Jullian Taylor and want to see what he offers the rest of the season. Who knows, it might be JT and our #1 draft pick together on the field next year. Let’s hope it’s better players than Jullian Taylor playing next year or we will be in serious trouble. I believe you are correct in regards to Lynch. He could add something to a winning team that has discipline but would be a terrible influence on an untalented, rebuilding team. Hmmm, anyone watch the morning sports show? Sounds like the Niners are in the news. I read about, and I am not buying it due in part to her past history of being a liar. She falsely accused someone in the past, and has now admitted to lying under oath. I am not trying to be mean here, but Elissa Ennis needs something more concrete than her word that the 49ers tried to discredit her at the team hotel in Tampa Bay, because what she says isn’t worth much thanks to her history of lying. Regardless of whether Foster is guilty, Ennis is not a credible witness and her actions beg the question of how much she is simply interested in the spotlight and/or money grab. I made a mistake. I fully admit it. I surmised that JL was either clueless, or complicit. I now think he was not clueless. So you believe, based on a prone liar, that he was complicit? So you believe a woman beater? Nice try you piece of $&!+, but there is no evidence that Lynch is a woman beater. Anything that Ennis says has to be taken with a massive grain of salt given the fact that she has proven to be a capable liar. Don’t let Quixote get under your skin. It’s what feeds him. Yeah, you’re right East. I need to learn stay away from his malarkey. Every time I try to have an intelligent conversation with him, my brain wants to sue me for putting it in such a situation. He’s a patience troll! Kind of like a kid who is constantly saying to their parents “Can I have this! Can I have this!” And on and on! I feel for anyone who thinks they can have an adult conversation with him. He’s about himself and making himself look good: greatest fan, greatest social warrior, greatest wordsmith, greatest draft predictor, greatest friend, greatest husband, greatest empath. Too bad the only thing he is truly great at is being a turd. Come to think of it all that reminds me of someone; someone with orangeish skin tones and an all too familiar propensity for diarrhea of the mouth (via Twitter). His is here but the similarities are amazing and ironic. Yes, I also think Ennis was lying, when she made that recantation. I wonder how much she was paid to do that. Thank you for proving East’s point. East tries hard, but he seems whiny and desperate. Guess he thinks that trying to make fun of some one, makes him look smart. Too bad it does just the opposite. BTW, I claim victory when I manage to get my detractor to resort to hurling an expletive. You seem to be rattled, and need to calm down. ‘There is no evidence that Lynch is a woman beater’. You need to think before you write. Of course, that makes them even more upset. Defending DV is a no win situation. East tries hard, but he seems whiny and desperate. No, that is clearly you. No one else has attacked Lynch’s integrity in order to justify their idiocy, and then act a holier than thou victim. Correction, Darren has done so, which speaks volumes about you and him. Quite honestly, you’re nothing short of pathetic Seb. I am heeding East’s advice and will no longer feed you. Mid, I am glad you learned your lesson. Like Shoup, you like to dish it out, but sure can’t take it. Don’t worry, if it’s longer we can repost all the drivel from last year, or the year before and still get that warm and fuzzy feeling you are still posting “original” content! Yes. The severity of the initial injury alone was enough to have me think this could well end his career. The fact that an infection has settled in raises questions about saving his leg. It’ll be a tough battle. Agree on all points Cassie. What evidence do you have that Jed York is the one keeping the FO from spending money on free agents? How do you know that it isn’t JL and his minions that aren’t spending the cap space? And what do we know of Denise York’s role? Wish Grant would seek out and conduct an interview with Denise. What key free agents have the Niners passed on because of money? Make a list of all the good FAs signed by other teams. That would he a starting point. What’s your point Jack? We spent more than anyone else on the worst roster in the NFL? But still had a lot more we could have spent. Hmm. Nothing wrong with this picture. Right? Wrong. Spending it properly is. The Yorks ARE the one constant…………….with the Yorks, GM’s and Coaches come and go, but one thing remains: the Yorks and a huge cap margin. Not sure if he could play single high, but I think he would be a good FS in a two deep scheme. I said this the day we signed him. I think heb be great at single high. Not having to change direction chasing receivers. Straight line speed, can turn and play the ball, and can tackle. I think he’d be perfect, starting next year. Yup, I think they should move RS to FS, and provide savvy veteran leadership, so opponents are not running open uncovered.. He is too slow to play the type of Cornerbacking he likes to play. TB game, he was targeted 5 times and gave up 5 completions. Maybe they should start DJ Reed and Tarvarius Moore at CB, and put Ahkello Witherspoon at SS, so he does not have to play CB. You don’t make a poor tackler play box S.
Agreed. Too much ground to cover in our scheme. Disagree..he’d cover plenty of ground as a safety.more than as a cb. I don’t think he still runs a 4.54… honestly I think he’s getting close to 4.7 these days. Hypothetical, but was it a good signing if we only get two years out of him at CB and he can’t transition to S? Should we have pursued Trumaine Johnson or spent a high draft pick on a CB? I agree that he was has turned out to be a good signing. And I’m all for signing a FA corner as I believe a lot of the edge rushers will be franchised or signed, so bringing in a corner is a more likely off-season acquisition. *Note* if one of those edge rushers makes it to FA, make sure were his first visit and get a deal done. Unfortunately there not that many good free agent options that would fit what the 49ers want in a CB. The best options could be Worley and Rowe, but I wouldn’t be surprised if the Raiders tagged Worley, and Rowe is pretty bad. I think that is where many of these teams go wrong. Verrett wasn’t a scheme fit in SD either as he was too small. However, he has done well because he can stay with most receivers and plays the ball. The team should be able to make anyone with those skills work. Verrett is a CB I really like and do believe could excel in the Seattle style defense run by Saleh, but he has been like Ward in the fact that he is unable to stay healthy; it could potentially be argued that he is more injury-prone than Ward. 80, I just do not want Ahkello Witherspoon to play cornerback. However, it seems as though they still really like him, so he would do less damage at SS. He certainly is not fast enough to play cornerback, also. Completely disagree. Plenty fast enough for safety. And the perfect ball hawk. Old man comment aside, I agree with Jack that Sherman is probably not fast enough to be a FS. I think he would do better at SS. Lame is a huge understatement. Vance McDonald seems to be holding is own so far this year. Not HOF material perhaps, but still on the field. I like the first two picks in that mock Cassie, but another defensive tackle with that third round pick? They have more important needs. I think Bosa is a no brainer, or Ferrell. They need a linebacker to replace Foster. Don’t know enough about Joseph. This draft has to be defense, defense, defense, and maybe a sleeper WR in the mid to late rounds. Looks like they have a solid stable of RB’s reading the Wilson piece so they don’t have to waste a pick there. Benjamin signing with the Chiefs. I’ll be interested to see how he does, since I thought the 49ers should have considered signing him. I think KB will do well, especially with Mahomes throwing to him. I agree, KS and JL should have signed him. How can the Niners win against the Broncos? By running the ball. Do not have Mullens pass more than they run. Line up Wilson deep in the I, with Juice lead blocking, and go either right or left. Let Wilson build up a head of steam before hitting the line of scrimmage, and let him pick the weakness in the defense. Niners should take advantage of the Denver defensive speed by doing counters, misdirections and reverses. If confronted with a stacked box, spread them out wide and attack the edges. Mullens should roll away from Von Miller’s side. On defense, the Niners should stack the box and dare them to pass. They need to set the edges. Even Saleh admits he has done a poor job coaching them to set the edges. They need to key on Phillip Lindsay, and be aware of his receiving skills. They need to shake up the secondary. Maybe put Sherman and Harris at safety, and DJ Reed and Tarvarius Moore at CB. Use Witherspoon sparingly. Saleh should dial up some exotic blitzes. On game management, if the Niners are losing, go no huddle with quick varied snaps. Letting the play clock run down to zero is incompetence, if behind. The Niners should prepare thoroughly by having a 4th and short play designated before the game. If confronted with a second and short, take a shot down field. Even if it fails, it will still be third and short. Believe it or not, this is a winnable game. Niners just need to stop beating themselves. If Saleh was doing the absolute best, he would not be 2-10. However, since they are ranked 15th, Saleh has markedly improved the defense.